Leg 64 – Run and Be Seen! 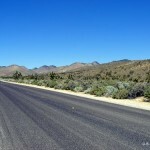 The first few miles of South Las Vegas Boulevard heading north out of Jean, Nevada is mostly uneventful. 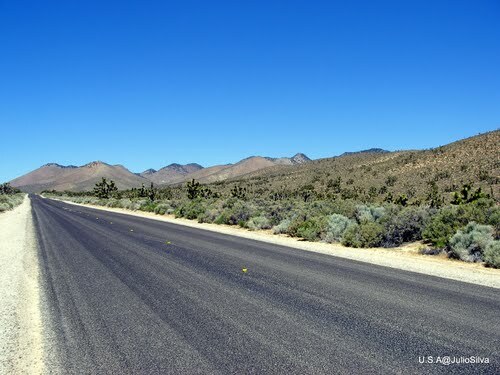 It seems to be a quiet road with beautiful views of the desert and mountains. Moving ahead another six miles on the A2B Journey, I find myself about half way between Jean and the southern part of Las Vegas. Another solid round of stretching before the evening run with the local running club. This run calls for extra stretching, since the course is nothing but hills. Plus, I tend to run a little harder with a group. Tonight’s run was also a race with Mother Nature. The weather forecast called for scattered thunderstorms. As we prepared to run, the looming clouds seemed “sufficiently distant” to get a run in. Besides, most of the runners were not bothered by the possibility of being caught in a rainstorm. So, off we went. Most of the run was uneventful. About half way into the run, there were the occasional gusts that come with an approaching storm. With a little more than a mile remaining, the sky started a quick fade to charcoal gray. Having no shortcut options available, I picked up my pace a good bit. I felt a few random drops as I rounded the last corner and ran the last 200 yards to the finish. Fortunately, the sky mostly held back the deluge for another 15-20 minutes. Enough time for the remaining runners to make it back. I love these “Rain Races!” It is always fun to chase a storm to the finish line! Over the past few years, I have won (stayed dry) about as many of these challenges as I have lost (got soaked). But so far in 2012, I am undefeated!! As I write this, it occurs to me that it’s probably not a good idea to talk smack with Mother Nature! On my way home from dinner after the evening run, I came to a 4-way stop. Because I was on a neighborhood road at night, it was very dark. I stopped to let several other cars through the intersection. As pulled forward to turn right, a runner suddenly stepped in front of my car. I quickly stopped, nearly hitting him. With both of us quite shaken, I waited as he crossed the road and continued. He had been on the road the entire time. I had probably passed him as I approached the intersection. He obviously saw me and had assumed that I saw him. But, I never saw him. Fortunately, I was able to stop in time. A few minutes later, I witnessed another very similar near accident. Another car entering an intersection almost hit another runner. In both cases, the runners were wearing white t-shirts. In both cases, the runners were invisible to the drivers on the road. In 2010, I ran in the Tennessee Ragnar Relay. 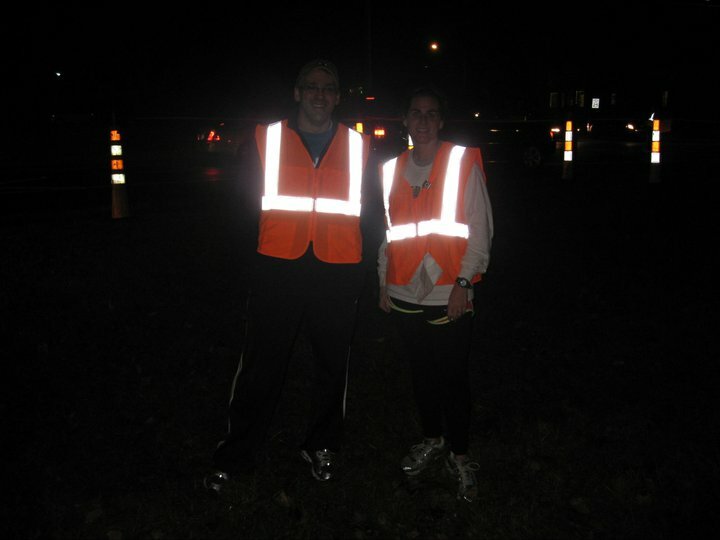 During the pre-race safety meeting, the good people at Ragnar effectively demonstrated that if you are running in the dark without reflective gear, then you are invisible to motorists. The attached video below offers examples of the benefits to running with reflective gear and the potential peril of running without it. Most general safety gear (i.e., reflective vests and safety strobes) can be purchase at any running shoe shop or at most sporting goods stores. Or, if you prefer something more fun and stylish, check out websites such as RUseeN.com and we-flashy.com. 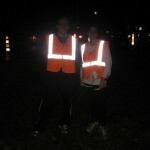 As for me, I always wear safety strobes on the front and back of my hat when running during the dark hours. Also, if I am not wearing a reflective vest, I use one of several shirts from RUseeN. For everyone’s sake,I want to provide every opportunity to be seen. As we move into the fall and winter months, the days are getting shorter. Inevitably, more of your morning or evening runs will occur before dawn or after dusk. Take time now to prepare and invest in your safety. On a slightly broader note, when approaching an intersection, the default assumptions is ALWAYS that the drivers have not seen you and do not know that you are there. Always plan accordingly. This rule applies in both daylight and darkness. With safety gear or without. I wrote a related blog entry about approaching intersections in Leg 19 – The Eye Contact Rule. Bottom line, you and you alone are accountable for your safety. Having said all of that, running is a wonderful sport! I love it! Go out for a run and have fun!! And be safe! We have to take responsibility for our own safety for sure and accessories help. Check out http://www.iondesigns.ca for reflective iron ons to customize your clothes and be more visible. I make them and they are on all my clothes. I’ve been told that If I’m hit now its because they were trying! !